Writing a great blog post is a lot of work. There’s the planning, the headline, the writing, the rewriting, the rewriting, the rewriting. As the cliché goes, a picture is worth a thousand words. So why not let your images do some of that writing for you? When you’re trying to get the biggest bang out of a blog post (while putting in the least amount of work), it’s smart to let strong imagery do some of your heavy lifting. But what’s the difference between an image that works hard and one that just looks good with your blog theme? Let’s face it, writing great headlines is hard. (Worth the effort, but still. Hard.) A great image can give your headline a big boost. The image might be beautiful, odd, heartwarming, instructive or just curiosity-provoking, as long as it makes the reader want to read that first line of your post. A powerful image zaps right into the primal bits of your readers’ brains and gets them in the emotional state you want. In an instant, a terrific image can create an emotional reaction you might otherwise slave for hours to craft with words. Images of puppies and cute little children will set one tone for your blog. Gritty street scenes will say something very different. I use a lot of images of apes and monkeys over on Remarkable Communication, in part to convey the primate emotional drivers that shape our communication, and in part because, hey, everybody likes monkeys. In fact, “lighten up” is a major Remarkable Communication theme, and that’s consistently reflected in the images I choose. Some images just make people feel good. And associating yourself with feeling good is a smart move if you’re trying to persuade. While a steady diet of kittens and rainbows gets cloying, it can be a good move to choose a photo just because it makes you smile. What’s the personality of your blog? Funny? Combative? Compassionate? Goofy? Imagery can set the emotional tone of a single post or for your whole blog. Lazy Blogger Tip: If you can’t find a good, relevant match for your post’s main idea, look for an image that conveys the emotional content of your blog as a whole. Just like making a ridiculous comparison can intrigue the reader and get her to keep reading, a striking image can work in the same way. The image can either create a seeming paradox with the headline, or just amplify the headline in a surprising way. A feeling of “What is this doing here?” can move the reader forward and right into your terrific post. The effect shouldn’t be too jarring, but a little unexpected juxtaposition can be just the ticket. There are free sources for stock photography out there, but in my opinion it takes more time and energy than it’s worth to dig around and find what you need. I use two sources for nearly all images I use. The first is iStockphoto, which has a wide selection of stock photography at very good prices. For a blog post, you can use their smallest size image, which will run you a little over $1 depending on how many credits you buy at a time. The great thing about iStockphoto is that it’s cheap and efficient. You use their search tool to find a couple of options, click, click, click, and you can get back to scrolling through the latest LOLCats. The second source I like is the Flickr Creative Commons. I shied away from this for a long time, thinking the licensing issues would be too complicated. But if you just search for images under the Attribution license, you’re set. The only thing that’s required is a credit, which is satisfied by a pleasingly effortless link back to the photographer. Other Creative Commons licenses have limitations on whether you can modify a photo (such as cropping it) or use it in a commercial context (which could be a factor if you’re monetizing your blog). Stick to the Attribution license and you won’t have to give any of it a second thought. Trust me, there’s virtually no limit to the fantastic Attribution images to choose from. The quality you can find on Flickr Creative Commons is as good or better than what you’ll get for iStockphoto, but each has different strengths. Flickr has terrific macro, landscape and botanical photography, and you can find great (and unusual) images of people. iStockphoto often does better than Flickr for animals and machinery, and offers high-quality shots of any object you can think of isolated against a white background. Flickr isn’t just a great resource for images, it’s a magnificent way to waste hours and hours of your time. Try doing some searches on your major themes from time to time, and mark your favorites for later posts. Instead of “procrastinating,” you get to call it “building your image library.” You can do the same on iStockphoto, building extensive lightboxes of subjects you tend to use again and again. As a lazy rule of thumb, the more iStockphoto imagery you use, the more professional your blog will feel. Using more Flickr images will create an artier, quirkier flavor. Try letting your images do a little more of the work in your blog. Your posts will be more effective, and you’ll save precious energy you could be using to play Rock Band. Then listen to this short podcast episode called How to Choose Arresting Images for Your Blog Posts (And Why You Should) with Jerod Morris and Demian Farnworth. And don’t forget to subscribe to The Lede once you’re done! Next article: Kurt Cobain: Entrepreneur? Note to everyone: those are not my feet. On yeah, and it’s free. Actually, I think those are Scoble’s feet. Can’t confirm that though. I’ve always had trouble finding images I could use to match the theme of my post – this is a great collection of sources for royalty free images. Thanks for the tips on where to find images that will match the feel and tone of your blog. I’m a techie who appreciates good design, and this helps! A tip from a designer: First try http://www.sxc.hu … it’s free, and if you can’t find an image you like there, then go to iStockphoto. I’m with you, Sonia. It’s istockphoto or Flickr creative commons for me. That zementa app that Will recommends sounds very cool though. I’ll have to give it a try. Nice post Sonia. But I learned how to find pictures via Flickr via old Seth’s post. Fantastic. I put a picture on each one of my posts and its not always easy to find the kind of picture you are looking for. Flicker Creative Commons is a great resource. Thanks for the great tips! After just spending an hour searching for a free image to illustrate my latest post, I have a headache. Maybe next time it’ll be easier. I wrote an article a few weeks about how to find free images to use on your web site, there’s ever a plugin for WordPress to do most of the hard work for you. Fantastic resources. I’ll be looking at all of these soon. My Blog thanks you. It will look much better now. There you go, Jonathan, making the best of adversity! They really do look like they should be Scoble’s feet. Can I just say something about iStockPhoto? If I see one more picture of a triumphant man/woman on top of a mountain or of a seedling sprouting from a moist little clod of soil in the palm of a hand, I’m going to stab my own eyes out. Nothing beats the ease of use over at istock. It is worth a buck to get right what you need quickly. Thanks for the advice! I just started using iStockPhoto and I love it. I will have to check out Flickr, as well. One thing I noticed about Flickr. Some of the photos are actually copies of copyrighted stuff, SO BEWARE and be very careful. For instance I saw some screen shots extracted from commercial games which could get you sued seven ways to Sunday if you publish them on your own blog or other commercial site. I can now spend writing headlines. I echo Will on Zemanta, which not only suggests Creative Commons BY-NC photos from Flickr but also Wikimedia Commons. Both can also be searched manually. I’ve been using Fotolia.com recently, similar to iStockPhoto. Hard to describe the differences between two very large banks of images, but in general they seem to have more artistic (and less corporate) images. Brian: those are NOT my feet. @Sonia – great article, thanks! Depends. Writing a great headline is hard for some people and not hard for the other. Thank you for the tip Sonia. I love iStockphoto, but I hadn’t even considered Flickr. Now I have a new source to mine, especially when I’m short on iStockpho credits. Robert, you have crushed the dreams of many. Thanks to Kevin & Mark for the compfight pointer, I will check ’em out. 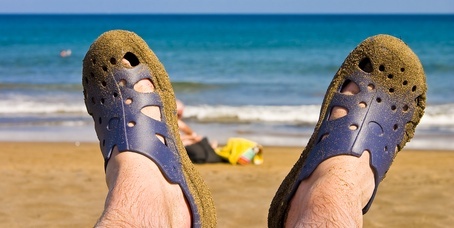 Men wearing sandals…not an image, or reality, anyone wants to see! I’m a really lazy blogger. It only takes me seconds to find a good photo. I just use the wordpress plugin Photodropper which searches only creative commons photos in flikr. So, within a few clicks I’m done. You can see from my website it even gives photo credit to the photographer. Flickr is my favorite source and it helps me find some really interesting, quality photos. I’d used Photostock for some professional writing, they are also a good source, if you’re looking for high quality photos at a low prize. Over all this article is very nice, specially the title! After reading the headline of this post, I was hoping to find Flickr Creative Commons images as one of the options covered – low and behold it was! It is definitely this time-strapped man’s source for all of the images I now use on my blog. This is so true! I just found a funny picture to bring home the idea of the assume and the silly thing brings people over. You have a great blog and usually I get sevearl things out of every post. Thanks! Give someone an AWESOME day!! I’ve always wondered where you got the amazing images you use at the top of your posts! The most important thing is getting the right pictures for your blog and placing it with the right alignment. Brian (and his co-authors) has done a great job in placing the right pictures on their blog posts. Frankly speaking, I ‘followed’ the way Brian’s way of displaying his post on the front page, including adding “read more about this post” feature in every third paragraphs for each of his post. Very clean and nice-looking indeed. This is a great tutorial, thanks for the tips…I needed these! I cannot say enough great things about Zemanta. I highly recommend it. Sonia, thanks for such a colorfully-written, usefun (useful + fun) post! The leading image definitely set the tone for what was to come, and making image-finding easier is incredibly important. As time goes on, this will be even more true of videos. I often use middle-click mouse button to open new tabs, and vertical tabs (by way of Tree Style Tab) save a lot of time. This was very helpful as price differences between photo banks are huge. I used to use fotolia. It has gotten pretty costly. Thanks for the tips and great links! Great to see a copy focused website doing a post on the importance of images. Nothing sets the stage for a message like a relevant and appealing image. I have been using sxc.hu for about one year for finding images (which are free to use) for my web designing and blogging needs, the results has been incredible. I wouldn’t have said it was lazy using istockphoto – you still have to do the research but it is certainly fun and addictive! I found that Photrade has specific support for bloggers to legally use images in their posts for free. I wrote a post on how to do it and so far am happy with the quality of the images available there. Another great resource is Wikipedia Commons. Pretty much all the images are free to use (the licensing details are provided with all the images) and the search function is pretty decent. I wrote an article about it a month or so ago @ http://www.dotcomdud.com/content-creation/a-picture-is-worth-launching-1000-ships-or-something-like-that/ if you want more details. Very good. I am forwarding this post to all of our writers. We are always looking for good images. Excellent advice – I too use Creative Commons photos in my blog posts. But, since I am an avid amatuer photographer, I also use many of my own image. Fantastic. Thanks very much. The Flickr tip was just what I needed. I had always been concerned about using Google images and now you have given me the perfect answer. Link building & Link Submission Services to Improve link popularity. Improve your Google page rank and search engine ranking with our advanced link building services. Request a Quote now for our link submission packages. Great advice. A suitable pictures can really pulls great attention. Engage the reader, that is the key I guess. -wikipedia images can be free to use, check the licenses under each image to be sure. Between these two I rarely have to pay for a photo. Another thing I will do is find an image of a product I am blogging about and e-mail the company to get permission to use it – they will usually say yes for a mention and link from your blog. I hate to admit it but I haven’t paid for a photo in months using these legal means. Must be the Scots in me. I second rebecca’s comment that morguefile.com is a good choice for pictures. I use them alot on my other blog, timmyjohnboy.com. They don’t even require attribution! I typically offer a link back anyways. I always have trouble finding good images to my blog posts , definitely going to check out the resources. Its amazing the amount of information you can find in the comments as well , might give photodropper plug in a try. Also, you can check out the zemanta browser plugin. It gives a nifty sidebar, including photo possibilites, and it works for many different blogging platforms. Wow! great post, as its always hard to find good images for my blog posts. Great write up, I share most all of my photos on Flickr under CC. I enjoy sharing them. I will bookmark this post for further research when needing photos. Not sure my technique is great but I travel a lot and shoot lots of images. I always manage to find an image that works, some better than others. That way I don’t have to worry about copyright and they are on my hard drive for quick upload. Just digging up an old article, I have to agree that feature images give your readers an idea to hold onto whilst they read your blog. I’ve tried to incorporate this into my blog for every post. I designed a student poster using a photo of the statue of liberty (that i thought was quite generic) … the producer recieved a complaint from the photographer. Apparently it was a rights managed aerial shot!